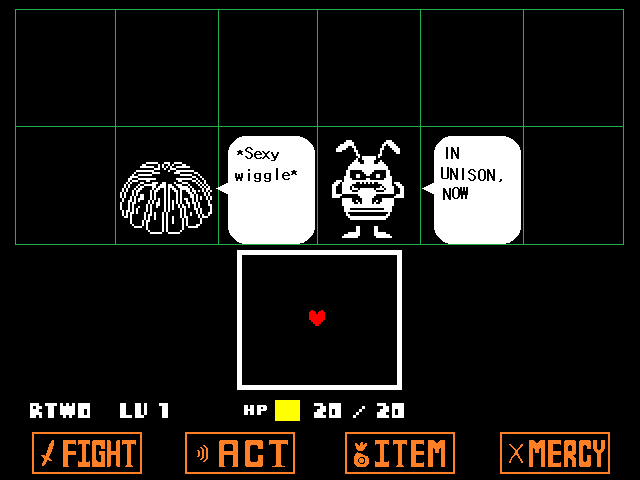 Reading this Undertale LP fills you with determination. 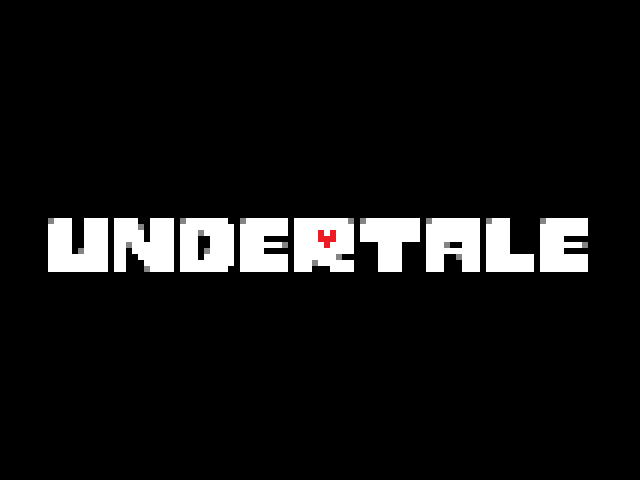 Undertale! 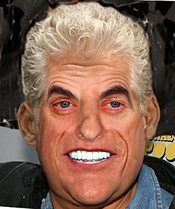 It's set the whole Internet ablaze with commentary and praise, despite it being the work of just one man. 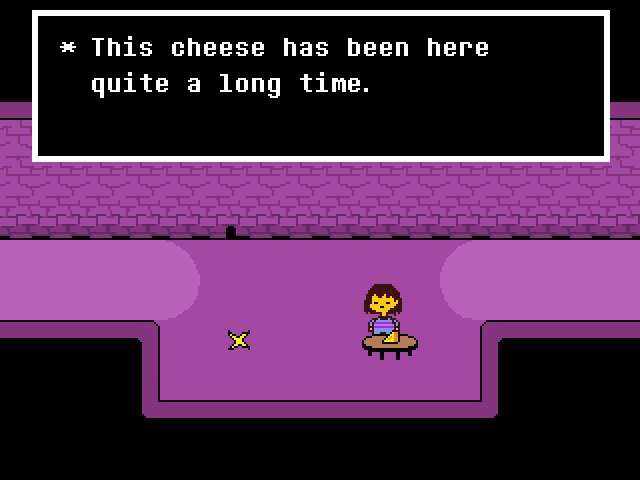 It's Cave Story all over again! 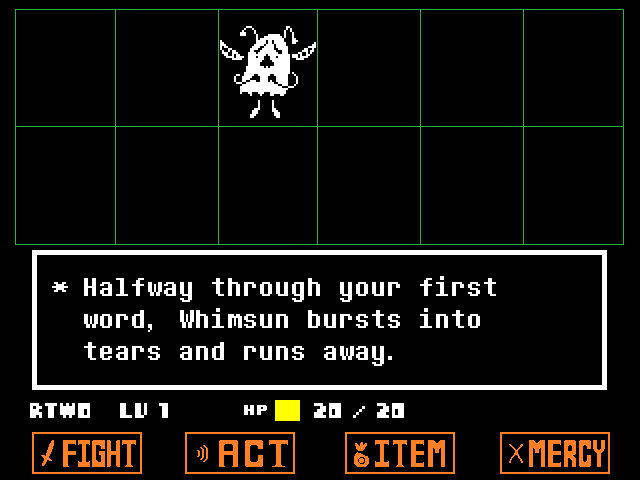 The game is RPG-style dialog choices, with some sort of actiony "he knows about timed hits!" combat. 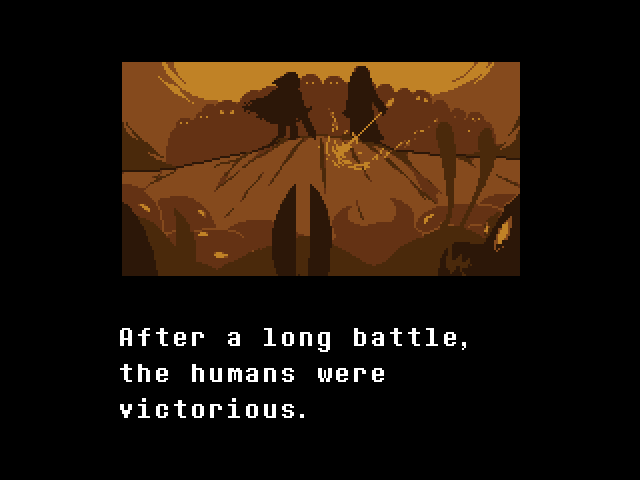 It is possible to win without killing anything you fight. You can date a skeleton. 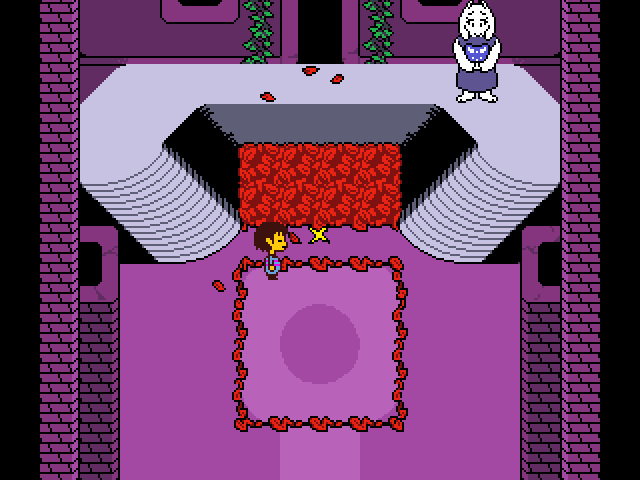 Episode 12, Playthrough 1: Who Does Alphys Have a Crush On? Episode 37, Playthrough 10: Kill. Everything. Episode 45, Playthrough 11.5: Do You Think You Are Above Consequences? 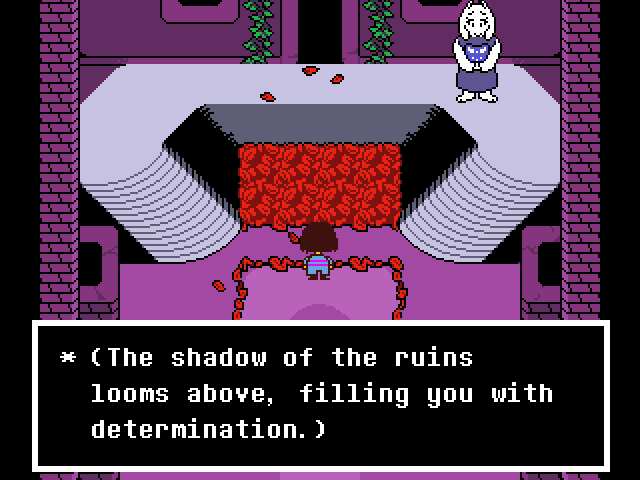 Re: Reading this Undertale LP fills you with determination. As always, open in a new window -- Shift-click or wheel-click is a Chrome shortcut that might work in whatever nonChrome browser you're in -- to let the music play while you read. Ain't that Steam popup obnoxious? The last word is MONSTERS, but I suppose you may have guessed that. 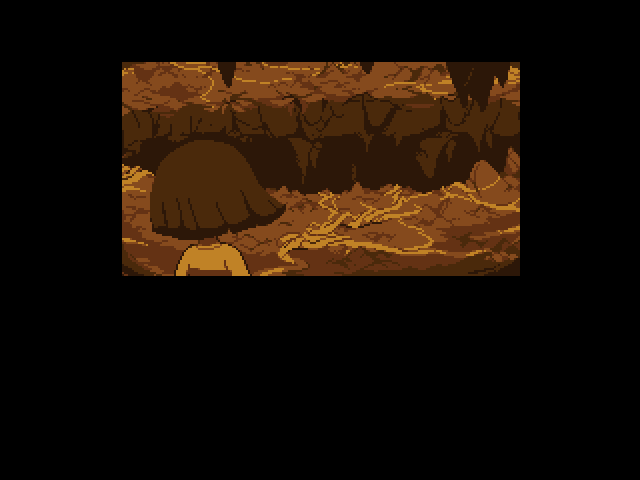 Narration: They sealed the monsters underground with a magic spell. 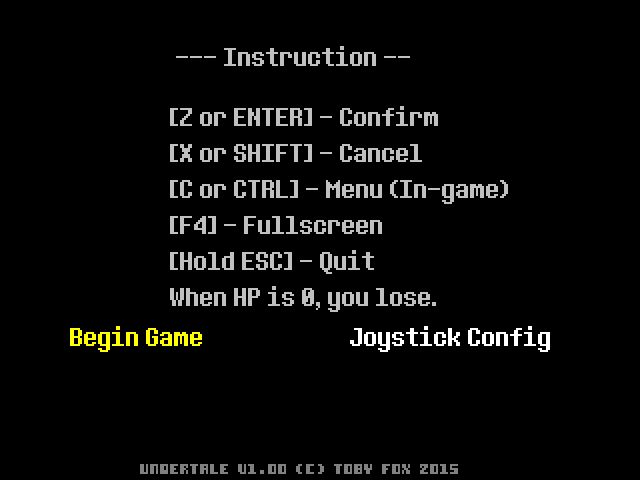 Well, the controls aren't complicated. There's a confirm button, a cancel button, and a menu button. Directional controls. And don't run out of HP. Okay. "nosimpleway" doesn't fit, so I stick with "Rtwo". 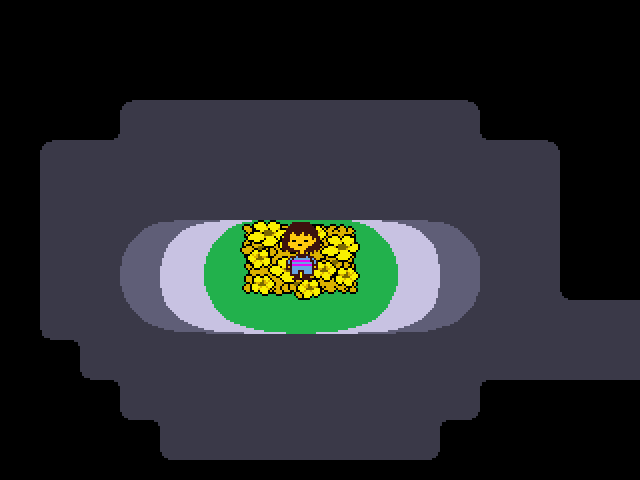 Our young protagonist wakes up in a small patch of flowers, growing in the one place with direct sunlight in the dark caves. 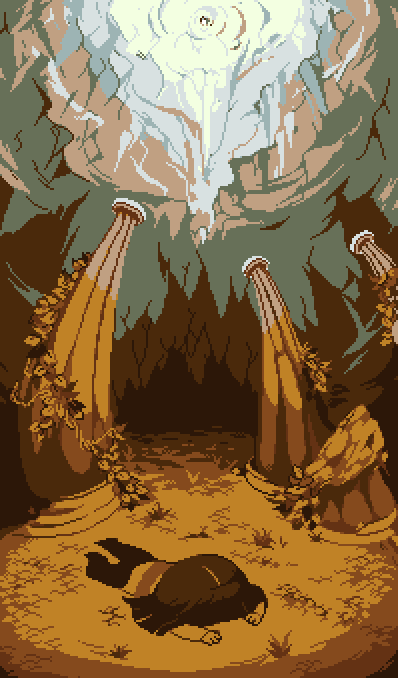 Well, maybe not "caves". 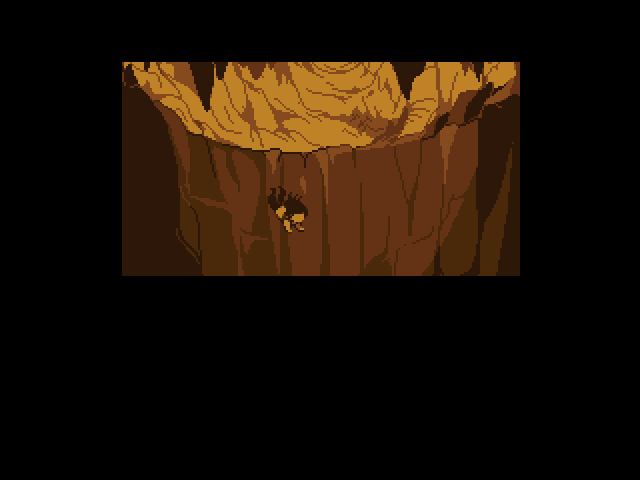 With a door that intricate it's pretty clear this isn't a natural cavern. : Hmmm... You're new to the UNDERGROUND, aren'tcha? Golly, you must be so confused. Someone ought to teach you how things work around here! I guess little old me will have to do. Ready? Here we go! 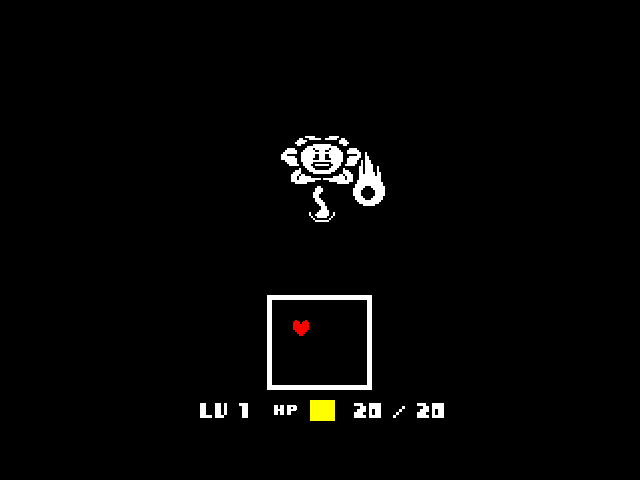 The protagonist's heart beats fast, then is removed as the HUD for our first combat screen appears. We can move the heart around inside the white-outlined box. And here Flowy pops out five little white pellets. 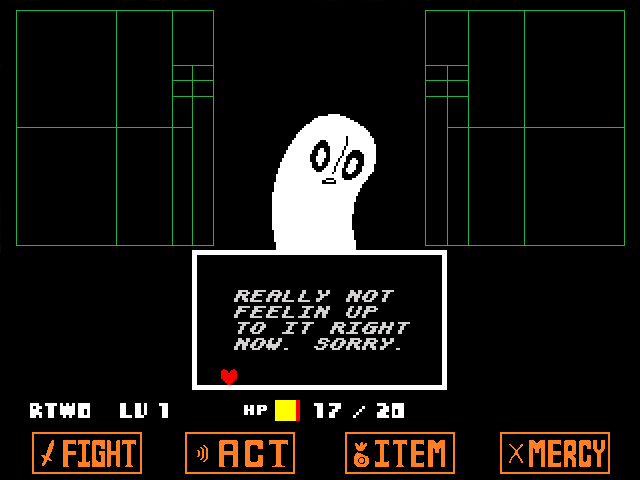 : Little white... "friendliness pellets." Are you ready? 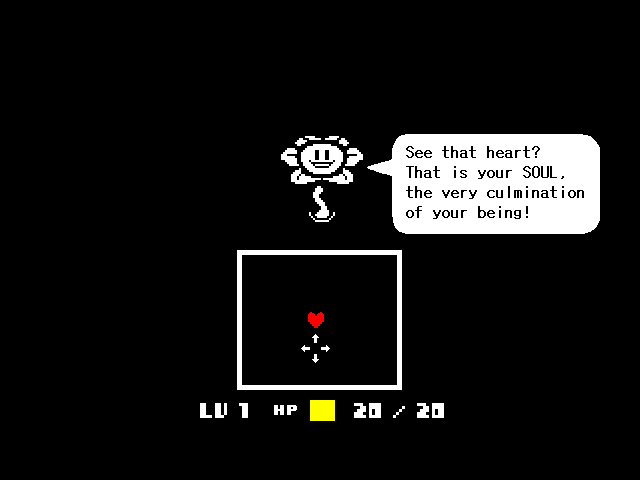 Flowy drops the friendliness pellets into the box, where I move the heart around to collect them, and... pow! Backstabbed! My HP! Dropped to 1! 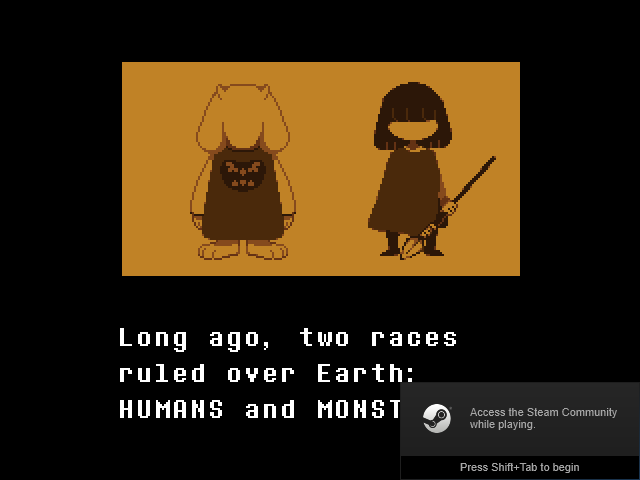 : In this world, it's kill or BE killed. Why would ANYONE pass up an opportunity like this?! 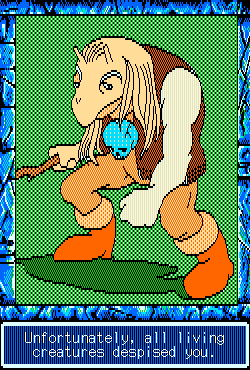 "Undertale" just makes me think of the Lusty Argonian Maid. 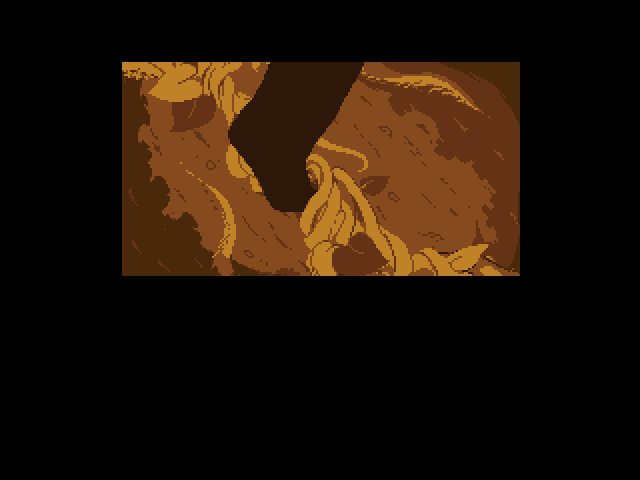 : Ah, do not be afraid, my child. 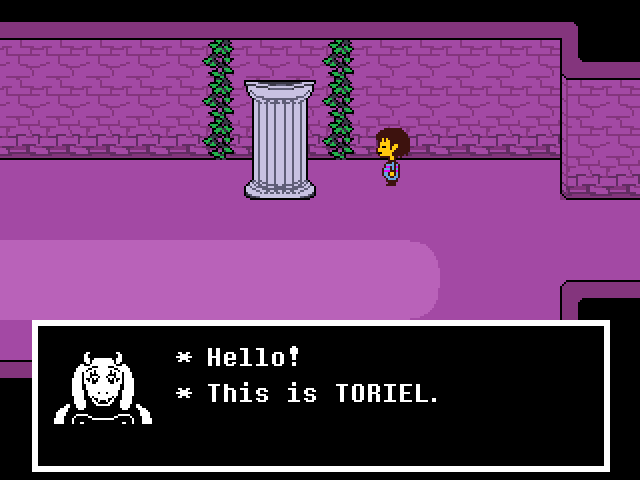 I am TORIEL, caretaker of the RUINS. I pass through this place every day to see if anyone has fallen down. You are the first human to come here in a long time. Come! I will guide you through the catacombs. 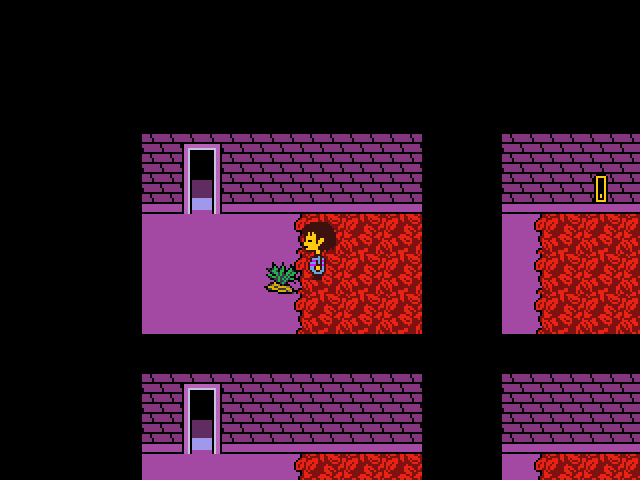 Wow, lucky you happened to be making your daily just-in-case-a-human-falls-here trip when I was attacked by that murderous flower. 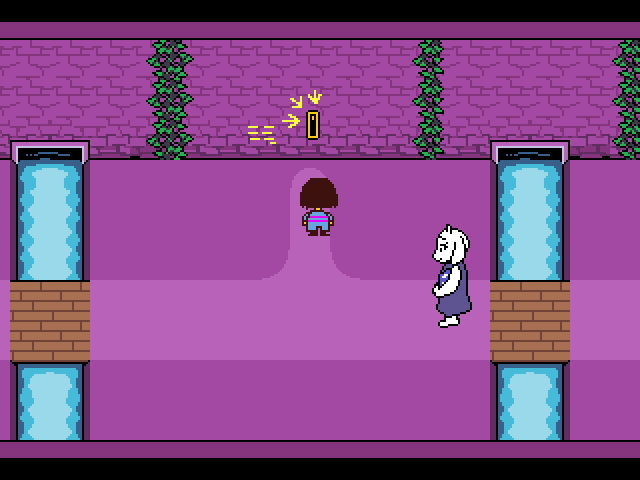 Toriel leads us through a few doors into some better-lighted corridors. 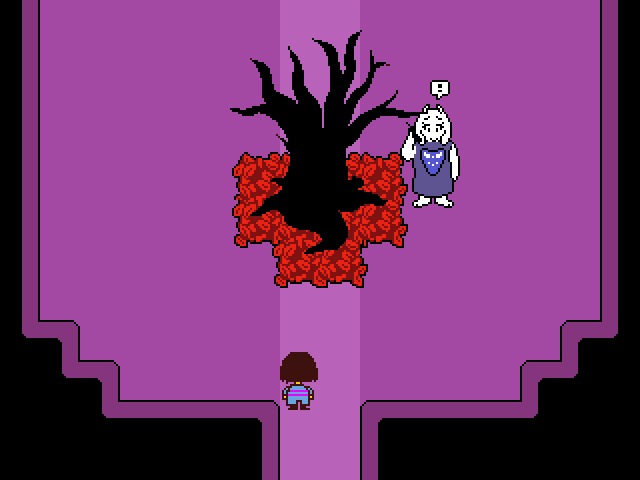 And the game's first save point, which fills us with determination. : Allow me to educate you in the operation of the RUINS. 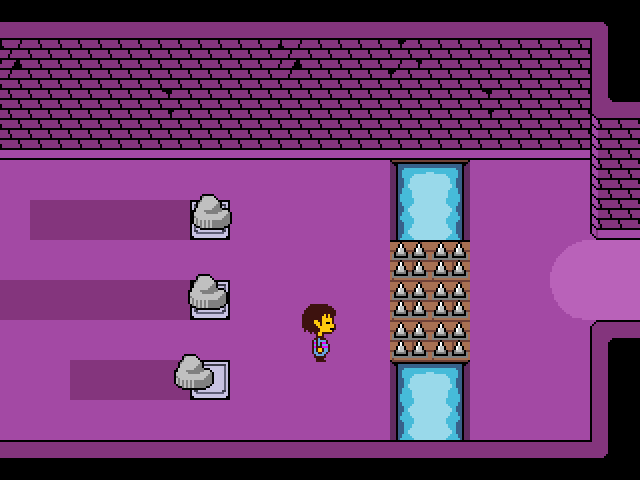 The RUINS are full of puzzles. Ancient fusions between diversions and doorkeys. Sounds pretty doorkey to me. : One must solve them to move from room to room. Please adjust yourself to the sight of them. 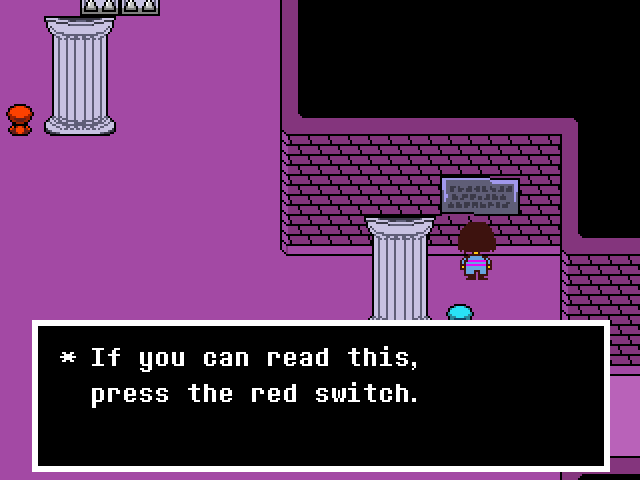 The next room has Toriel give instructions on switch-flipping. She has helpfully marked all the switches I need to press. : You will need to be prepared for this situation. However, worry not! The process is simple. When you encounter a monster, you will enter a FIGHT. While you are in a FIGHT, strike up a friendly conversation. Stall for time. I will come to resolve the conflict. Practice talking to the dummy. 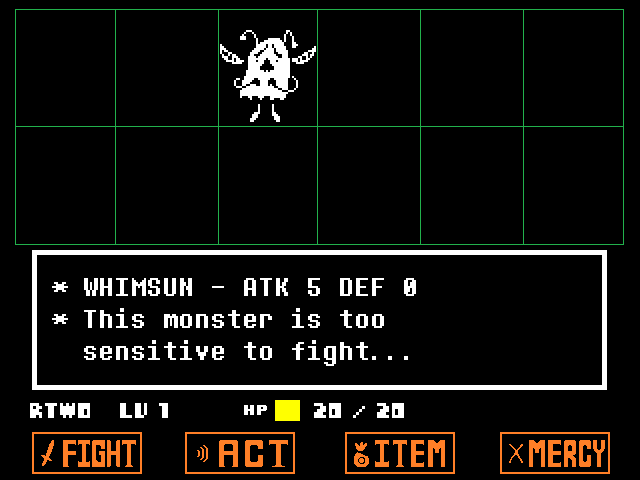 This is the full combat screen. Menu options are at the bottom. Fight lets you time a hit to do HP damage. Act lets you do context-sensitive stuff. Item lets you use curative consumables. Mercy gives the options to either flee an enemy or allow it to leave you alone. Haven't seen anything like that since Suikoden! 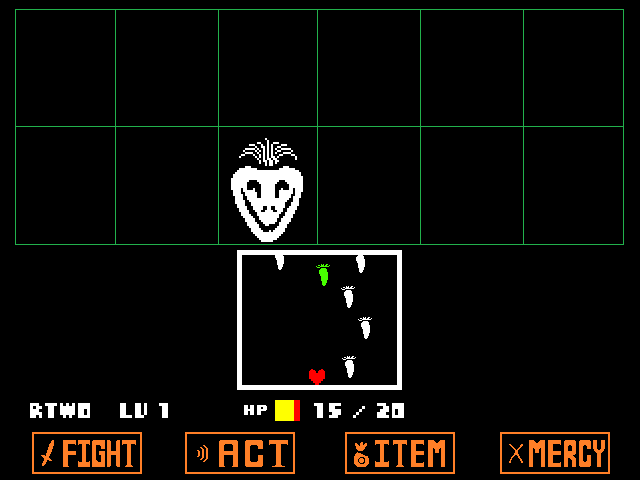 The first option under the Act menu is always (or nearly always, I haven't found any exceptions yet) "Check", which gives you a short description of the monster you're up against. It doesn't seem much for conversation. 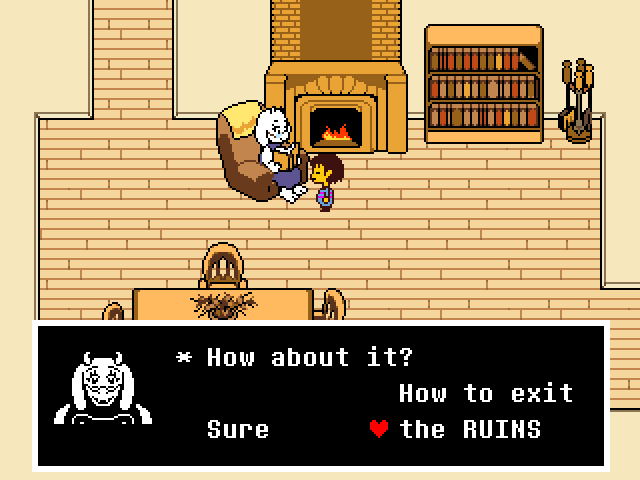 TORIEL seems happy with you. 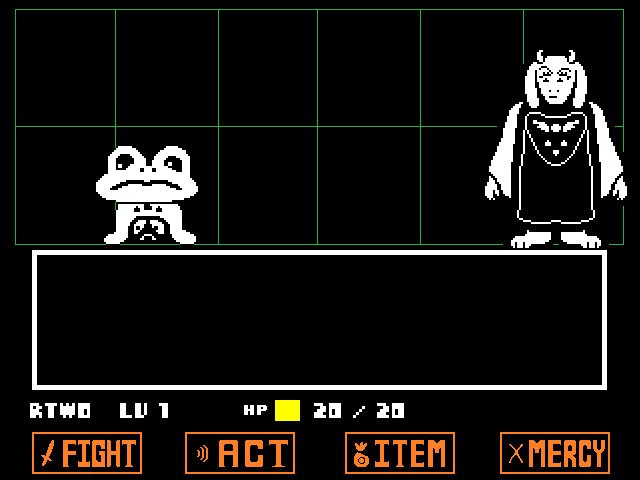 Toriel's withering gaze forces Froggit to leave us alone. 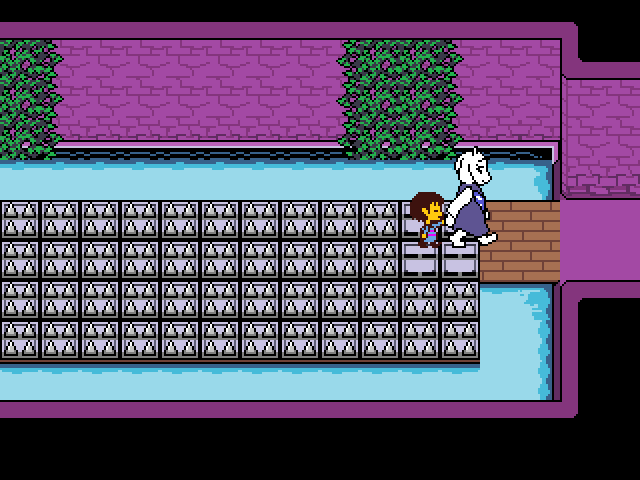 Toriel literally holds your hand through the tutorial dungeon. Until the room where she makes you walk down an empty corridor by yourself. 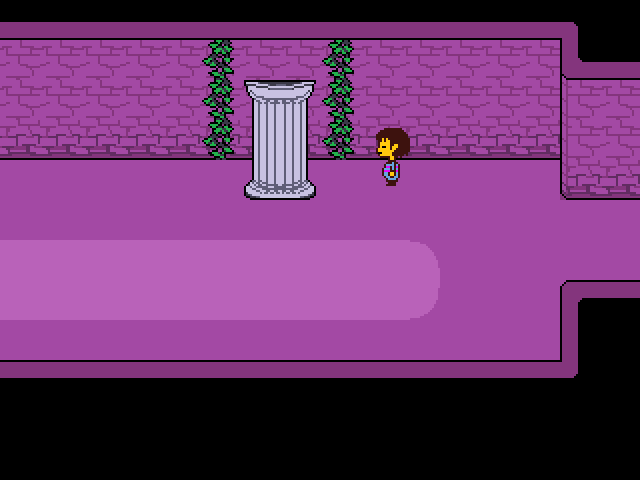 : I was merely behind this pillar the whole time. Thank you for trusting me. However, there was an important reason for this exercise. ... to test your independence. I must attend to some business, and you must stay alone for a while. Please remain here. It's dangerous to explore by yourself. I have an idea. I will give you a CELL PHONE. If you have a need for anything, just call. Be good, alright? I assume it's made of the living sort of cells, and is some sort of squirmy biological organism, because there's no way a radio-powered cellphone is going to get any signal this far underground. I obediently wait for Toriel to come back. : My errands are taking longer than I thought they would. You must wait 5 more minutes. Thank you for being patient. Five minutes pass, in real time. : Hello... 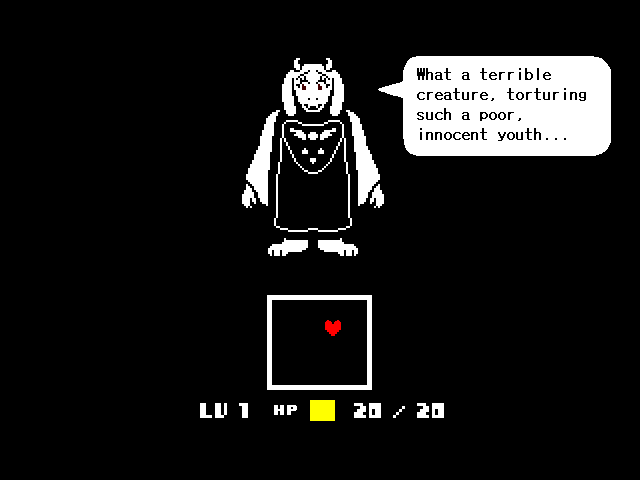 This is TORIEL. I found what I was looking for. But before I could take it... A small, white puppy snatched it away. How odd. Do dogs even LIKE flour? : Err, that is an unrelated question, of course. It will take a little longer. Please understand. Several minutes go by before the phone rings again. Narration: ( ... ) (You hear heavy panting on the other end of the phone...) ( ... ) Bark... Bark! 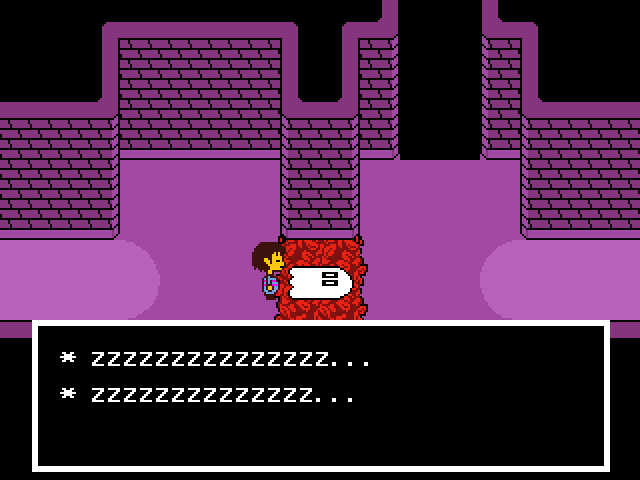 (You hear a distant voice.) "Stop, please! Come back here with my CELLPHONE!" 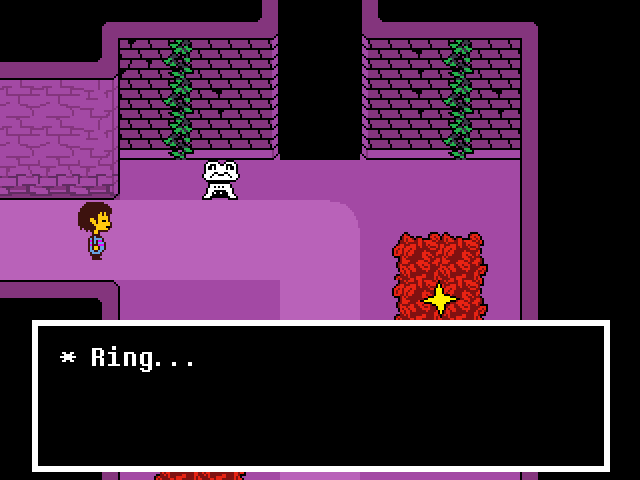 If you try to call Toriel's phone, as she tells you is possible, you get the message "Somewhere, signals deflected by a dog." I wait another several minutes, but that seems to be the end of it. : Hello? Hello? 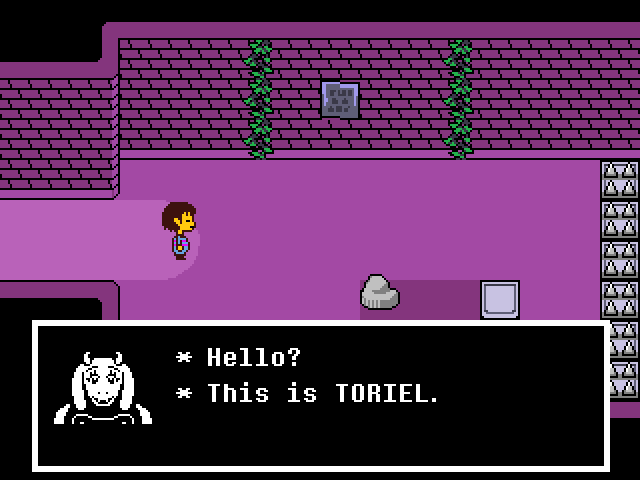 This is TORIEL. My apologies. A strange dog kidnapped my phone. So if you called, I could not have helped you. However, I have recovered it. 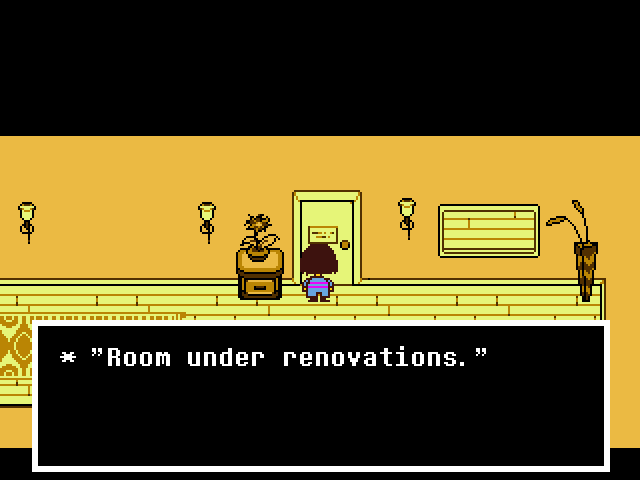 And you are still in that room, are you not? 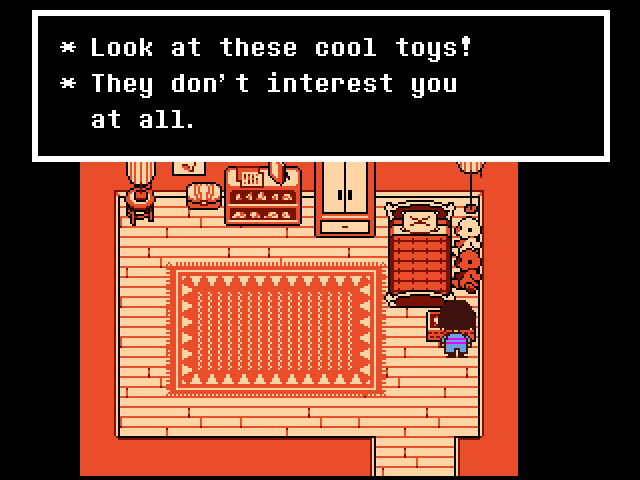 What a good child you are. There are a few puzzles ahead that I have yet to explain. It would be dangerous for you to try to solve them yourself. Be good, alright? We've already found out that waiting doesn't accomplish anything, so I may as well forge ahead. The nearby Froggit tells us that using the ACT command in certain ways may make monsters not want to fight us, and if that happens, that we should let it go with the MERCY command. 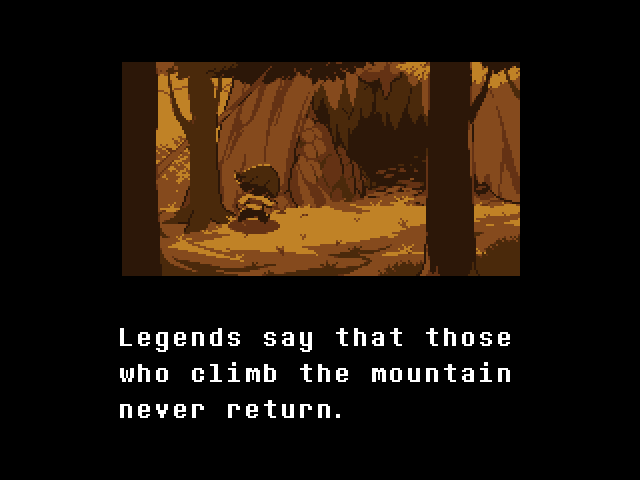 The nearby save point refills and HP we may have missing, and fills us with determination. 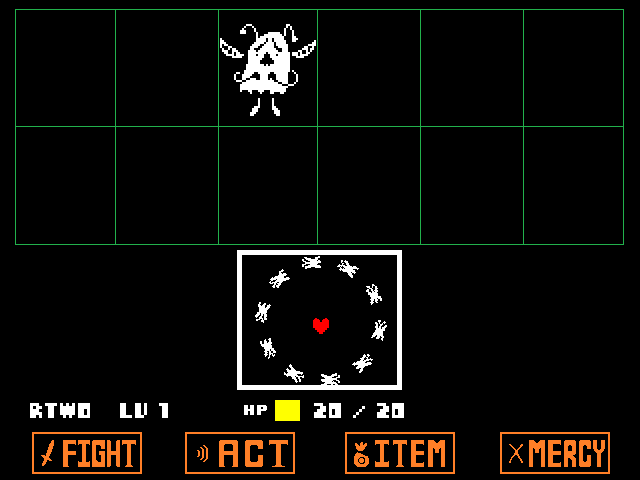 Music: Enemy Approaching, the usual battle theme. 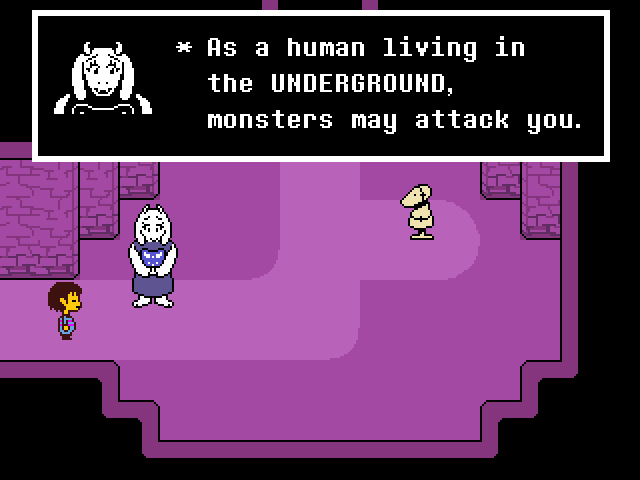 Toriel isn't here to glare away random encounters, but it's still the newbie cave. The monsters aren't very dangerous. 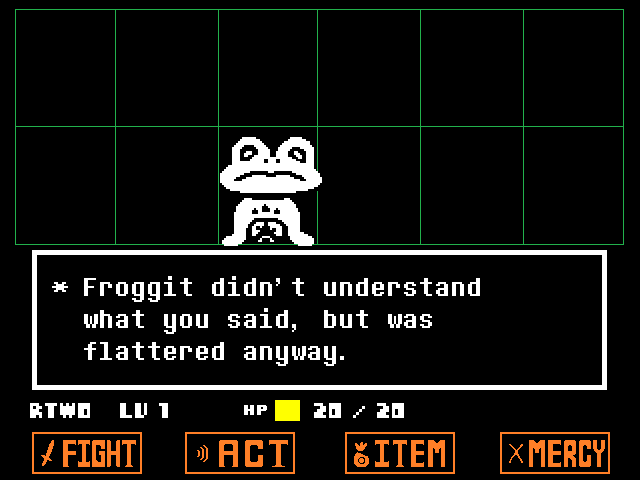 Froggit is likewise not particularly threatening, but responds well to flattery. Free consumable healing items? 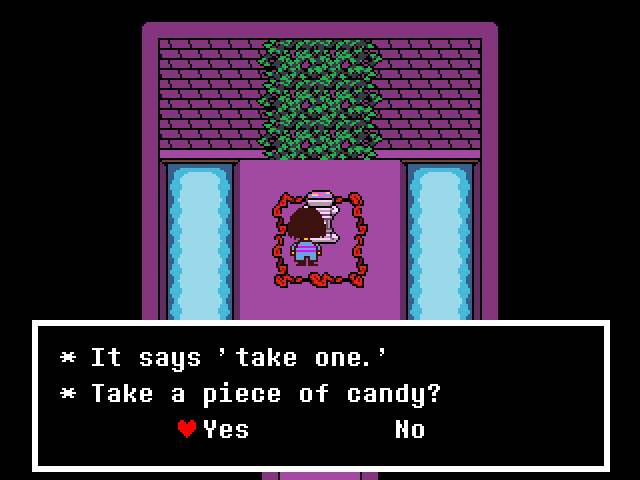 Why take just one? : For no reason in particular... Which do you prefer? Cinnamon or butterscotch? I tell her cinnamon, because... well, because I prefer cinnamon to butterscotch. 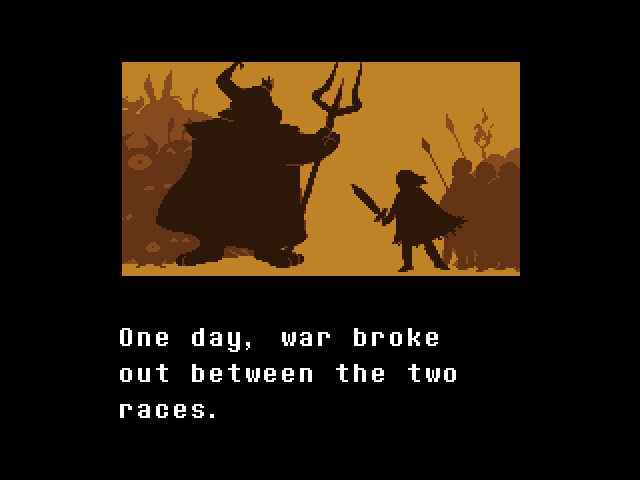 : Oh, I see. Thank you very much! She calls back two steps later. : You do not DISLIKE butterscotch, do you? I know what your preference is, but... Would you turn up your nose if you found it on your plate? Right, right, I understand. Thank you for being patient, by the way. 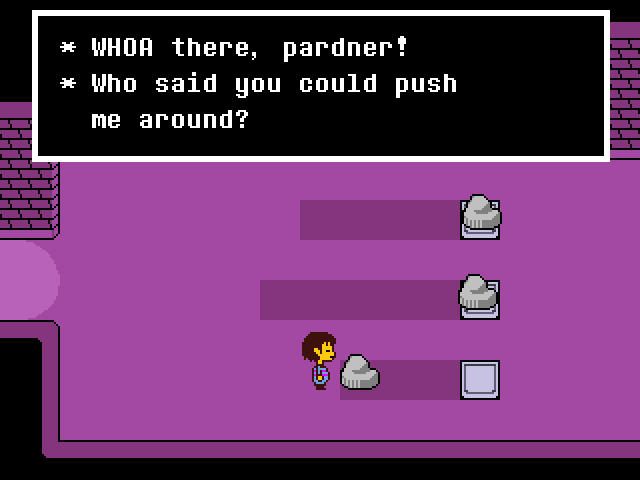 It's an RPG with "puzzles", did you think I wasn't ever going to have to push a stone or a crate or anything? 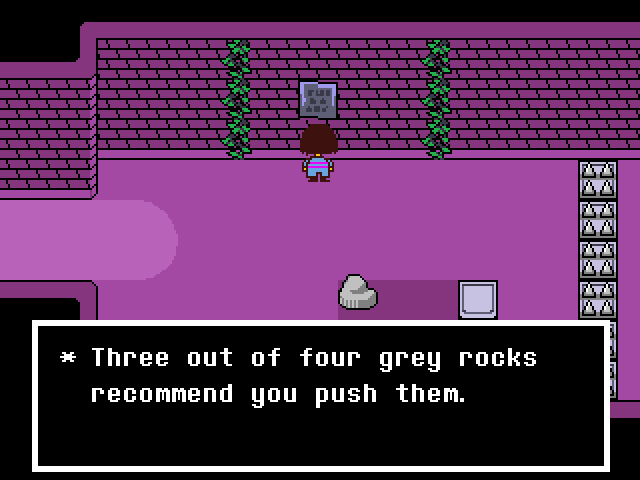 But as the sign implied, the fourth rock is a bit touchy about being shoved around. You have to convince it, gently, to sit on the switch for itself. Even then, you have to convince it to stay on the switch. Cheeky rock. So long, it's stuck to the table. 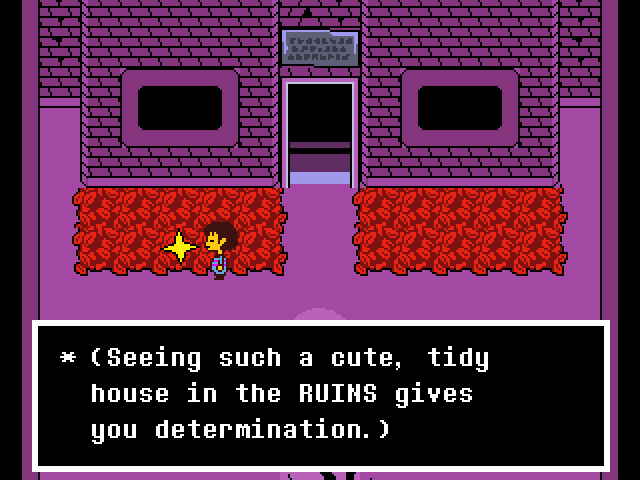 It fills you with determination! So you can save. You gotta. Music: Ghost Fight. 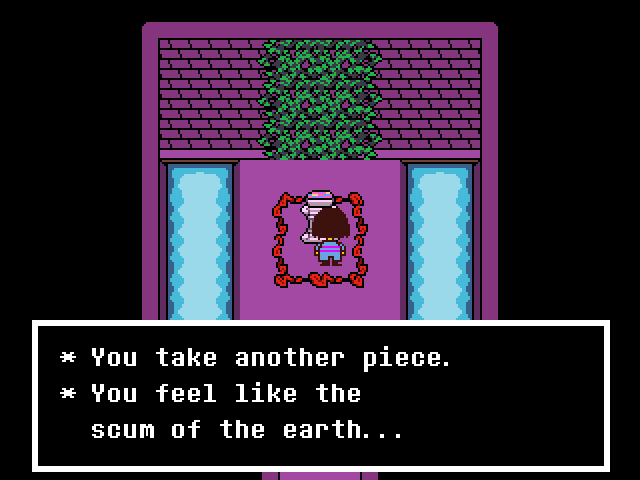 Sounds like Earthbound music to me. 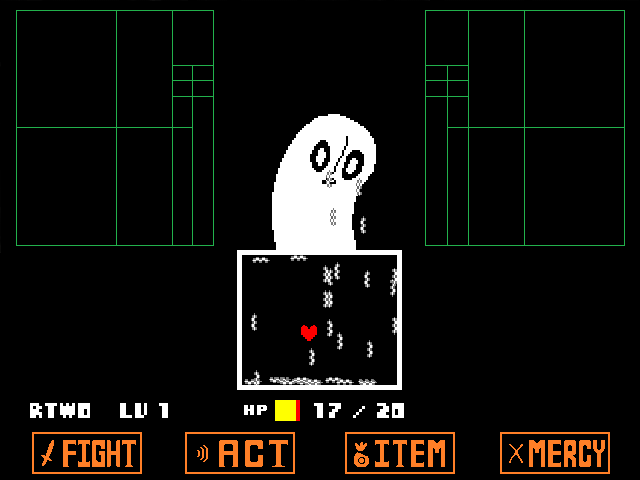 The ghost is named Napstablook, and his attack pattern is super hard to avoid. 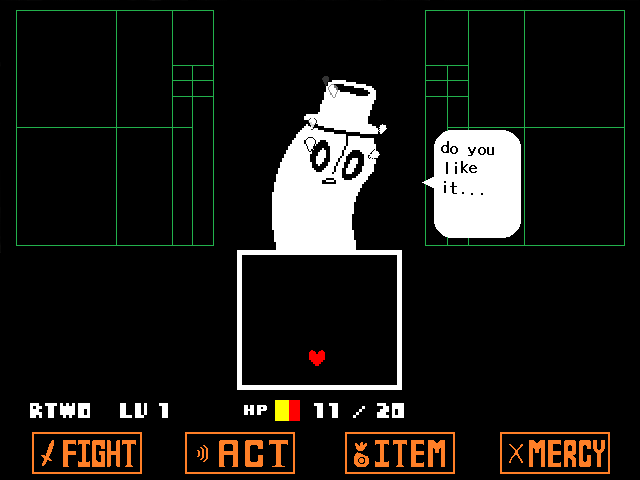 He shows you his "Dapper blook" trick. Applaud it, and he can be let go. 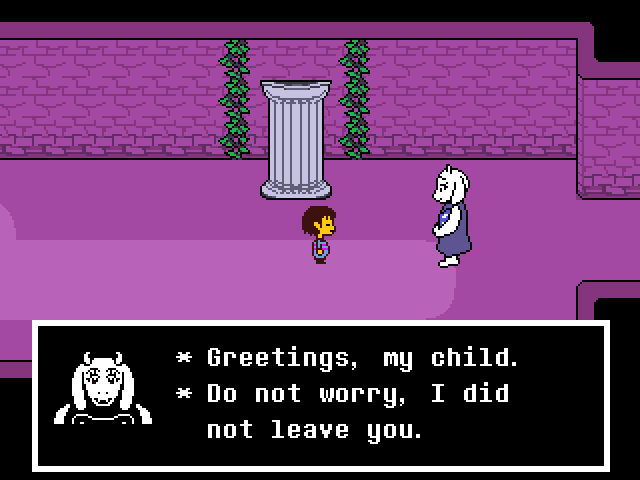 He comes to the ruins to be alone, but today he met someone nice! He disappears from his bed of leaves and lets you pass out of appreciation. 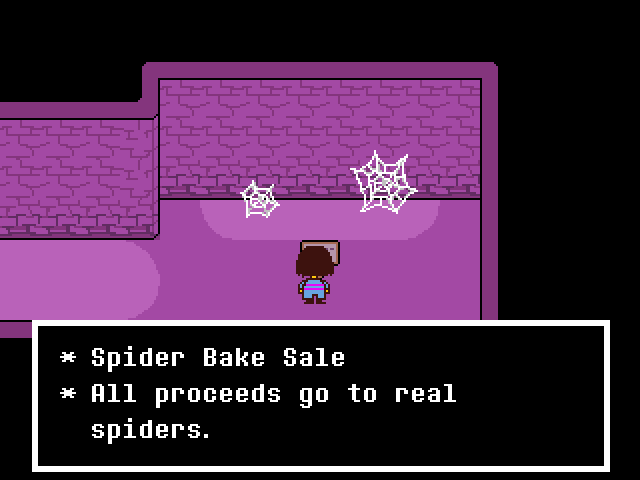 Spider bake sale! Made for, by, and of spiders! 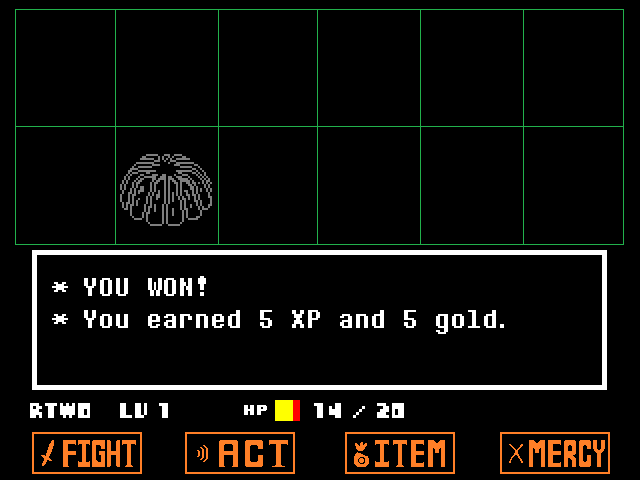 The next room lets you leave money in the webs. If you do, a spider will crawl out and give you a donut. You have to dodge both attack patterns at once. 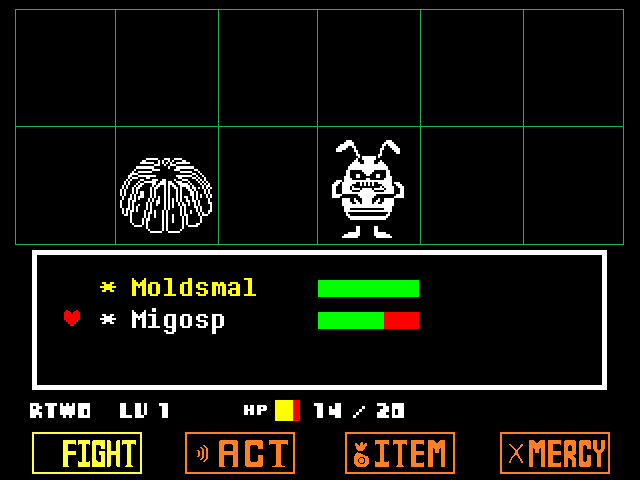 Moldsmal drops spores that might explode into bursts, while Migosp -- that's the guy on the right -- swarms you with bugs. 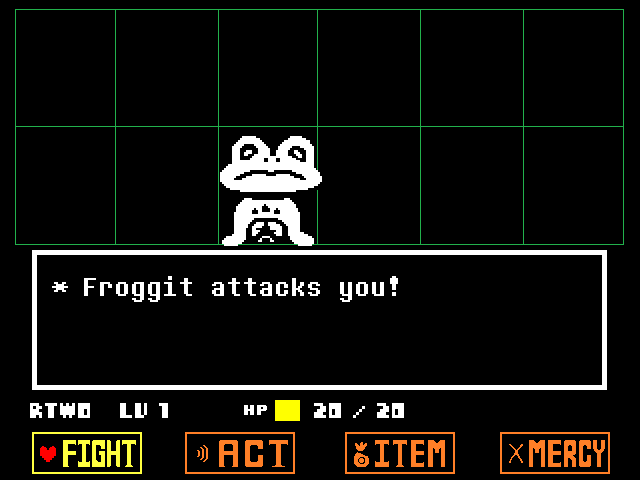 A Froggit in the last room tells you that monsters are ready to be Mercied when their names turn yellow. Moldsmal is easy to get rid of, but I can't seem to get Migosp to respond to much of anything. 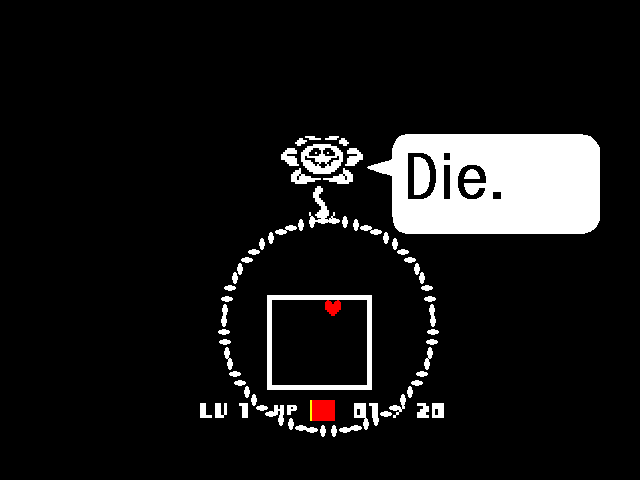 I end up killing a couple before I make it to the end of the ruins. 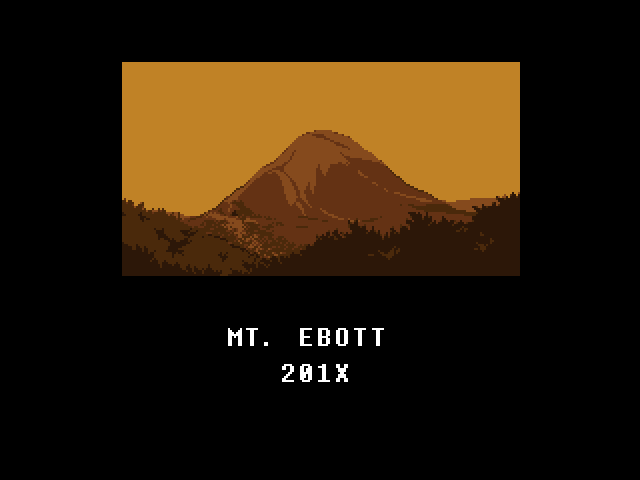 This nets me my first EXP of the game. Letting monsters go gives you gold, but not EXP. Indicating that the green-colored carrot missiles are good for you, and restore HP instead of taking it away. 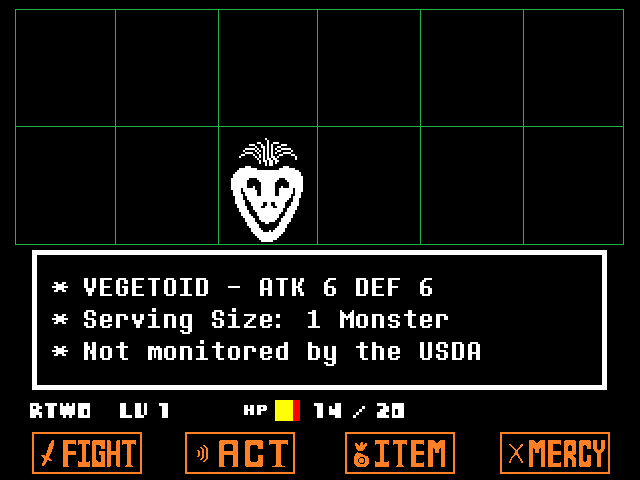 Vegetoid can be defeated by taking a big bite out of it, which restores even more HP. 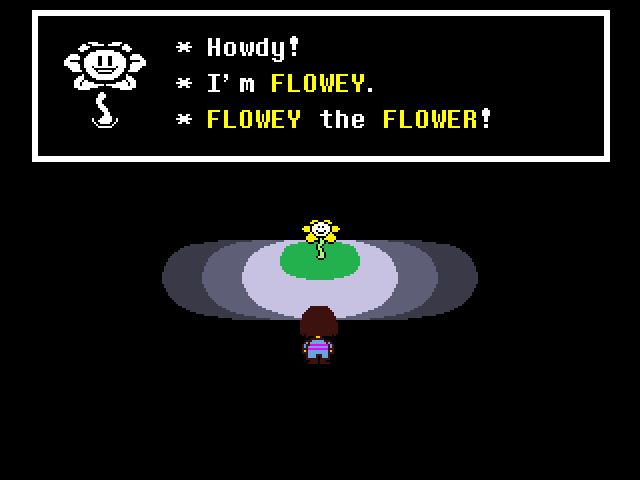 So Flowy wasn't just being saccharine, levels in this game really are made of LOVE. Which you get only by killing things. 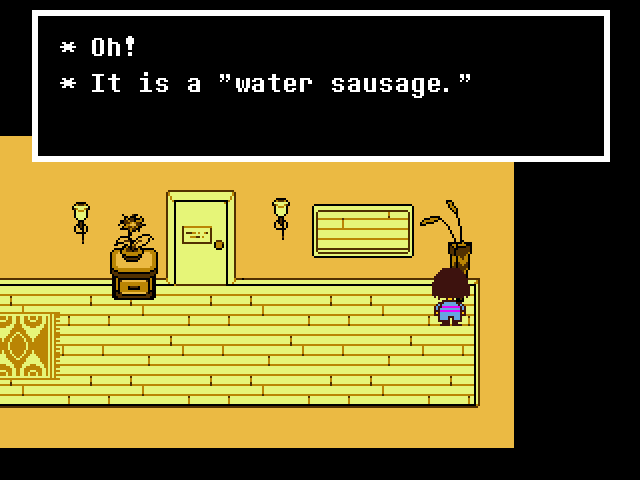 O... kay. Just a few perspective puzzles to go. We're almost done, I promise! : Oh dear, that took longer than I thought it would. How did you get here, my child? Are you hurt? There, there, I will heal you. I should not have left you alone for so long. It was irresponsible to try to surprise you like this. Err... Well, I suppose I cannot hide it any longer. Come, small one! And one last save. 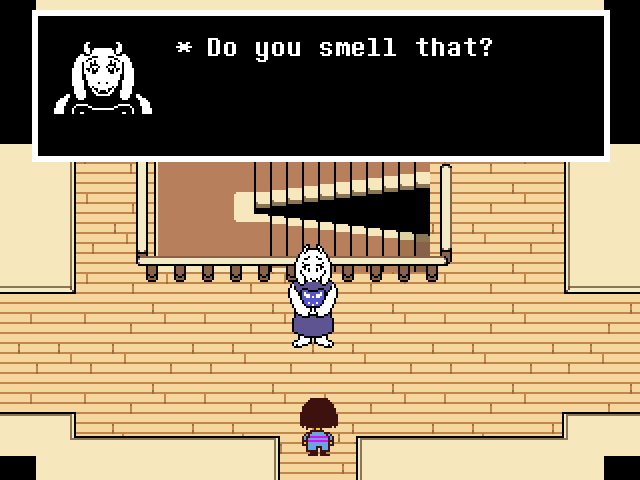 Next time: Toriel's surprise! 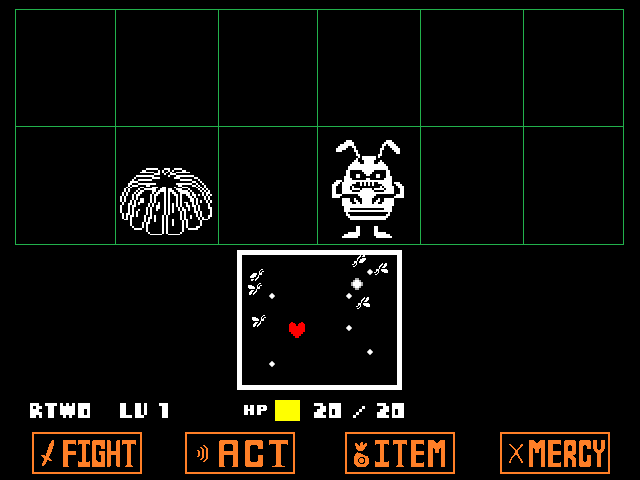 Might be mistaken, but I THINK I've seen Spare work before on enemies that aren't yellow yet. : Surprise! 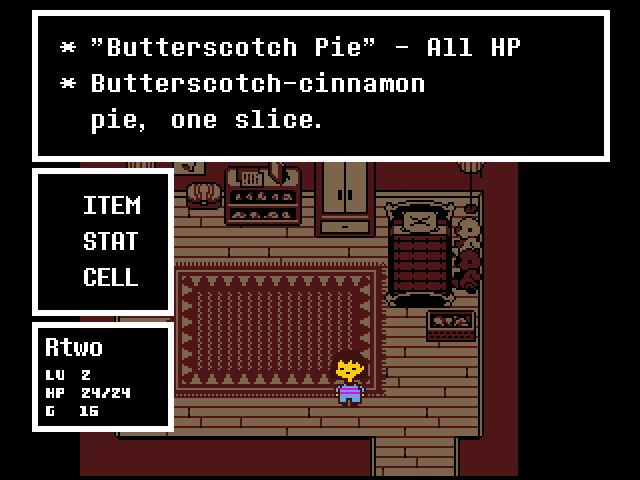 It is a butterscotch-cinnamon pie. I thought we might celebrate your arrival. I want you to have a nice time living here. So I will hold off on snail pie for tonight. 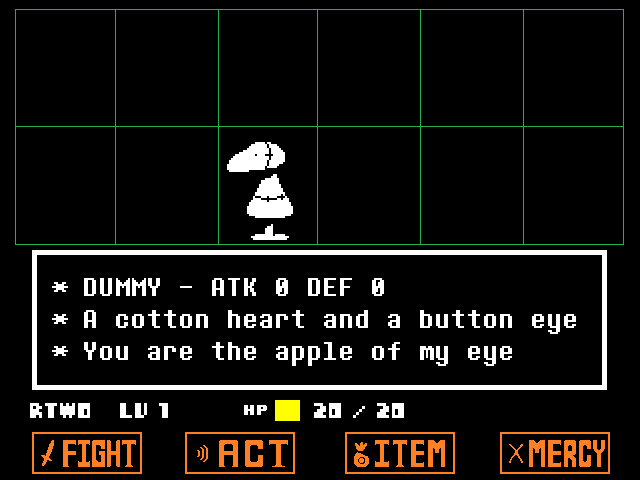 Aww, that's super-sweet of ywait what? Living here? : Here, I have another surprise for you. 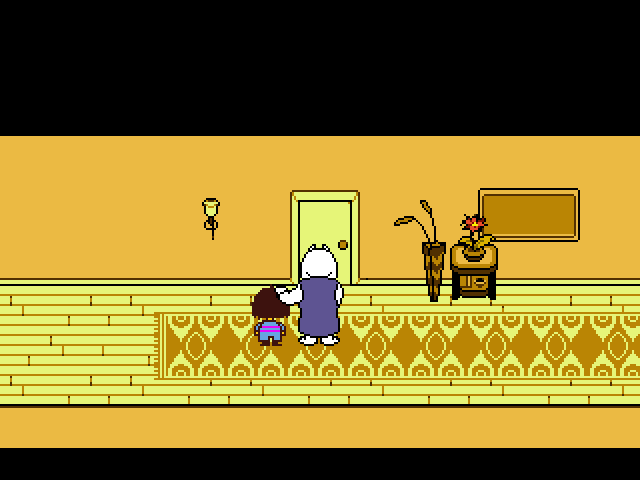 Toriel leads us into the next hallway. 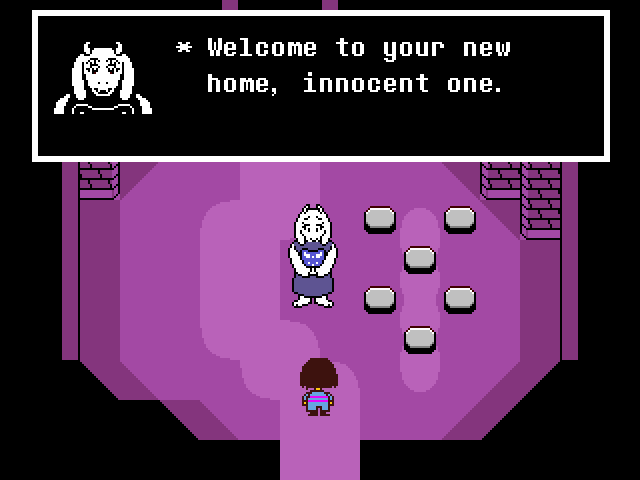 Toriel excuses herself, and we're free to explore the little house. 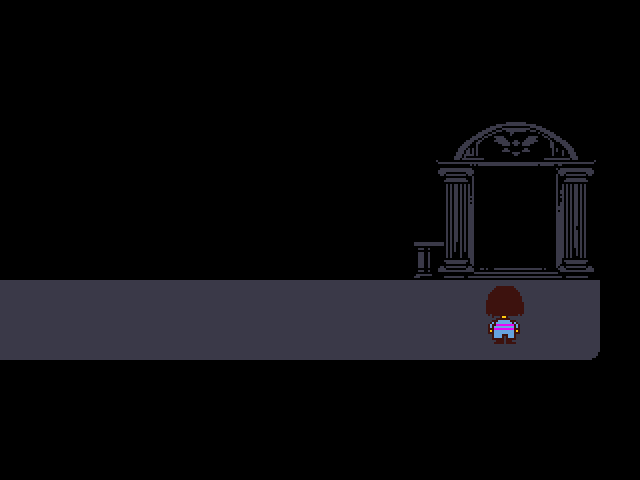 The music here is very peaceful and calming, and contributes a lot to the general atmosphere of a safe haven that Toriel is trying to give you. Shame YouTube doesn't seem to have the soundtrack up yet. Music: Home. Also in the room are a dusty, empty photo frame on the bookshelf and a box of children's shoes of all sorts of sizes. 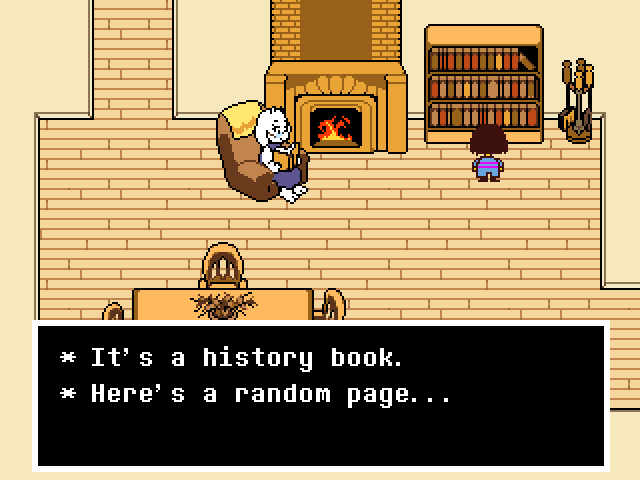 How long has Toriel been doing this? 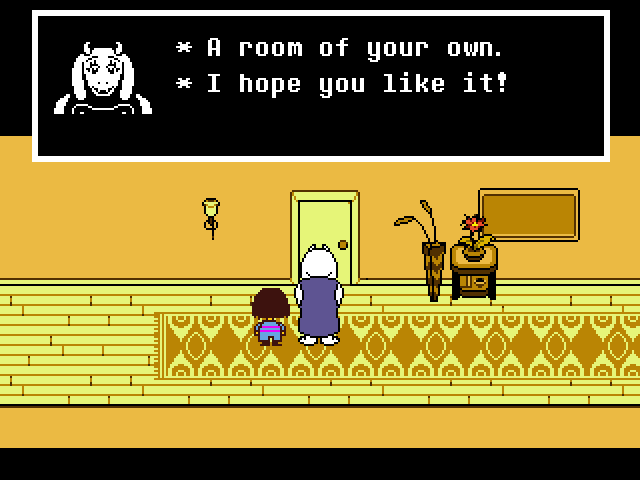 Toriel's room is all blue. 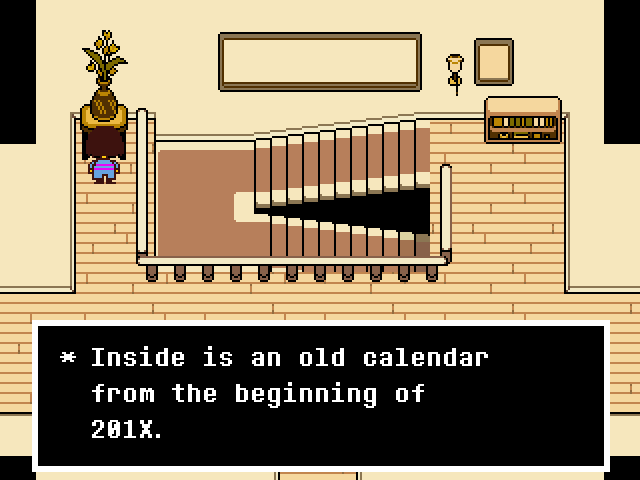 Also featured: her journal of bad jokes ("Why did the skeleton want a friend? Because he was BONELY." and those of similar caliber), her chair (named Chairiel), her sock drawer (described as "scandalous! 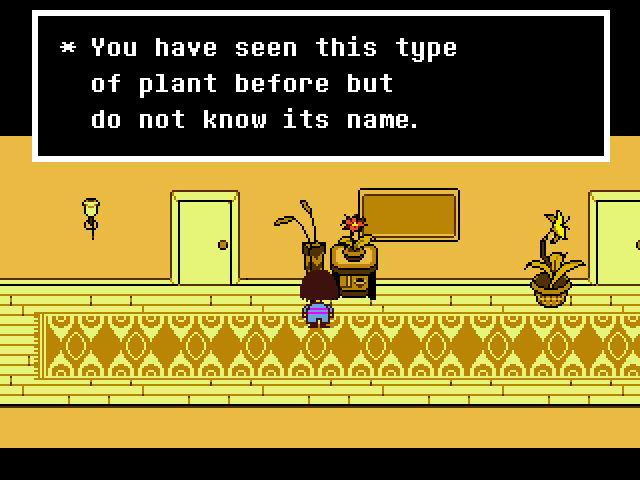 "), and a cactus (described as "the most tsundere of plants"). 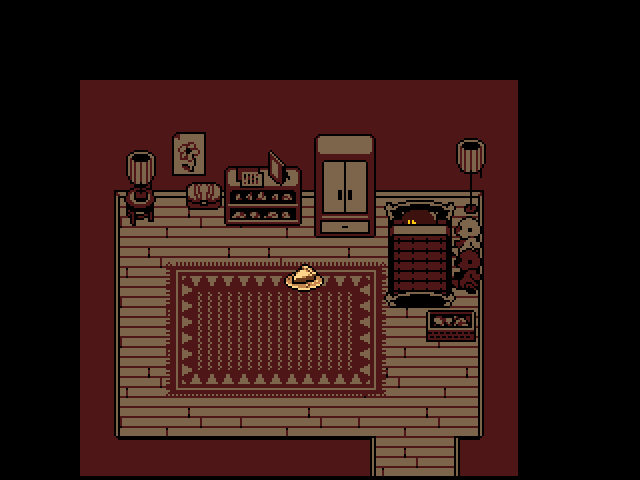 The only color in the room is a pot of the yellow flowers from before, only in this shot it's covered by the textbox. 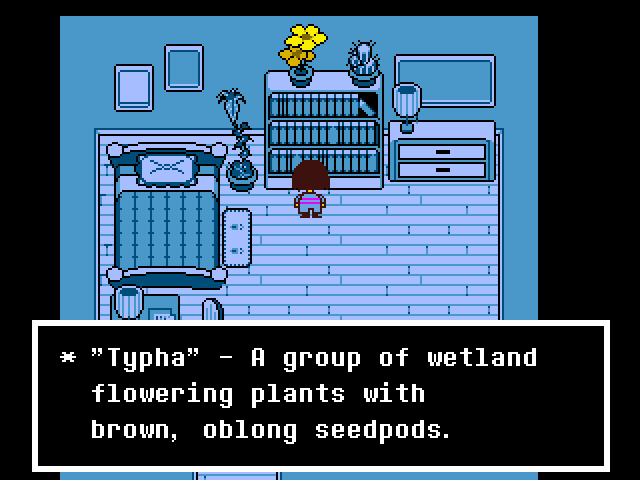 In a nice little detail, you can read about the decorative plants around the house in one of Toriel's books, allowing you to identify them. The hallway has an endtable drawer full of flower seeds and broken crayons, and a mirror. The mirror just says "It's you! ", since... well, that's all you see. Trapped behind the barrier and fearful of further attacks, we retreated. Far, far into the earth we walked, until we reached the cavern's end. This was our new home, which we named... "Home." 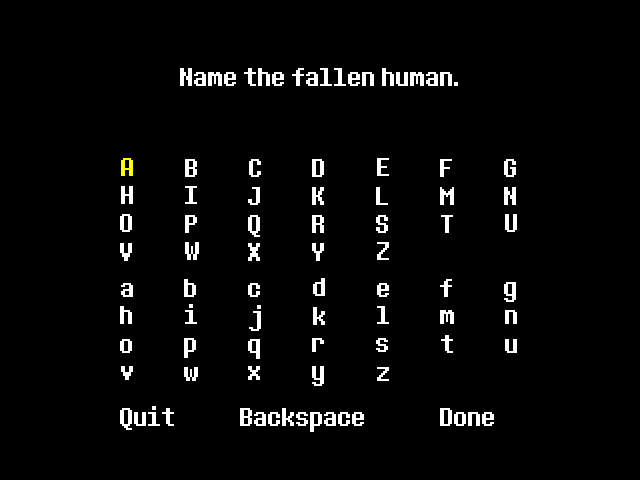 As great as our king is, he is pretty lousy at names. The pie isn't cool enough to eat yet, so Toriel recommends taking a nap. Further details in the kitchen include a chocolate bar in the fridge, white fur stuck in the drain, cookie cutters for gingerbread monsters, and a very clean stovetop. 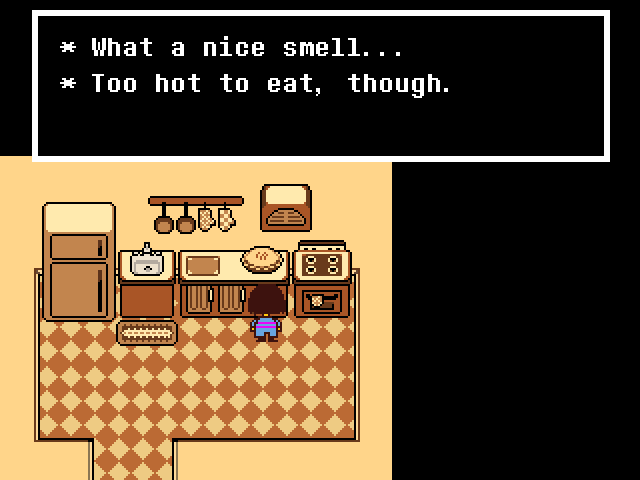 The last leads to some speculation that Toriel uses her fire magic for cooking as well as interrupting Flowey from killing human children. 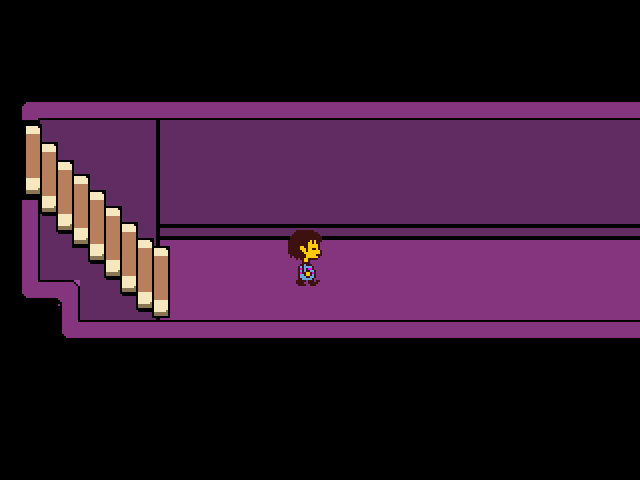 Trying to explore the basement just gets you gently chided by Toriel, then led upstairs by the hand. 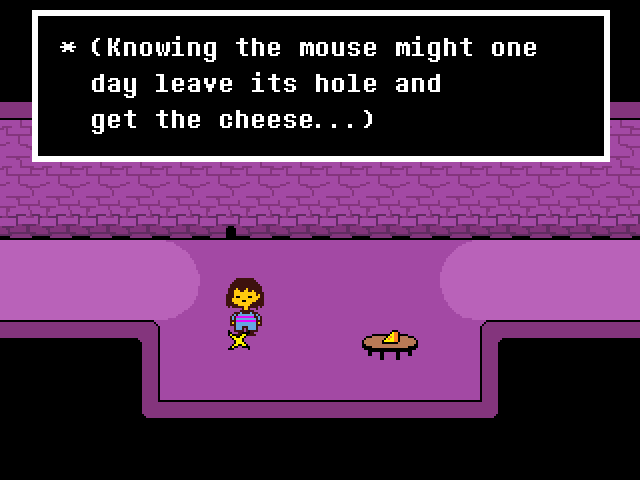 Toriel cuts the pie while you nap, leaving you a slice for when you wake up. Uh, on the floor. It's a consumable item, but one for "All HP" rather than a set number. 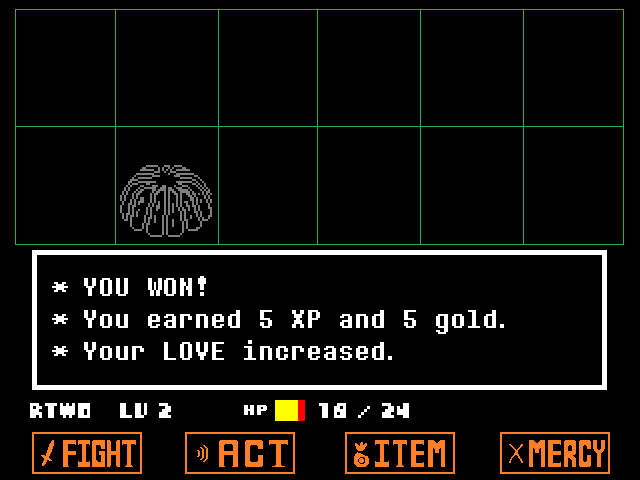 I might save this one for later in the game, when I have more HP than the 20 or so I have now. : Um, I want you to know how glad I am to have someone here. There are so many old books I want to share. I want to show you my favorite bug-hunting spot. I've also prepared a curriculum for your education. This may come as a surprise to you... But I have always wanted to be a teacher. ...actually, perhaps that isn't very surprising. STILL. I am glad to have you living here. 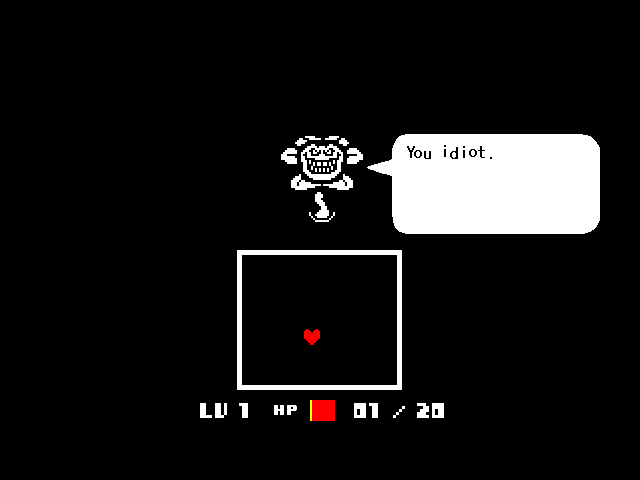 It's a triumph of game design and writing that I, as the player, actually regretted even asking the question. 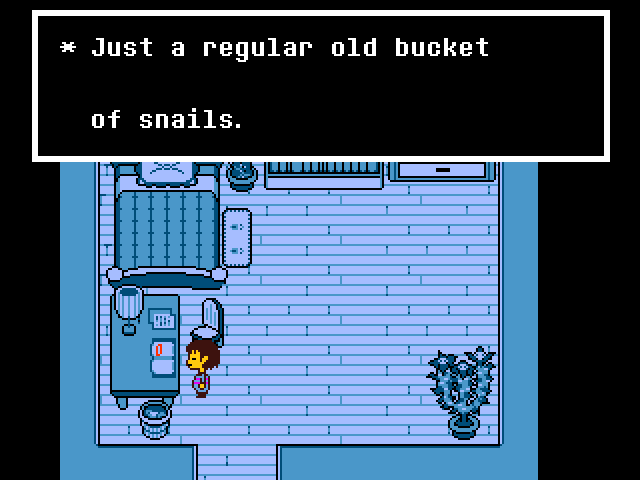 Toriel tries to change the subject by talking about interesting snail facts, forcing you to persist.